For my first post in the DUK category, I am going to pick on Chick-fil-A. Some people may just want to stop reading right now so as not to ruin a family tradition (or habit). And remember, I live by the 80/20 rule, so it’s not like you’ll never see me at Chick-fil-A. Although, I will say I haven’t been in a very long time. So, did u know that…. 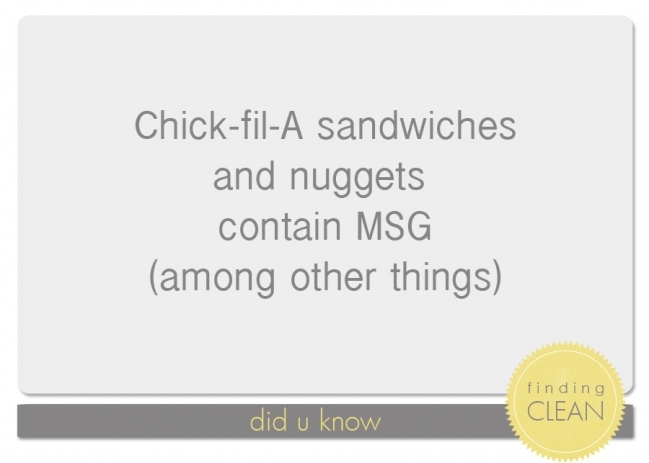 … Chick-fil-A Classic sandwiches contain over 30 ingredients, with MSG listed several times. They also include food coloring, multiple amounts of high fructose corn syrup (HFCS), food coloring, Sodium Benzoate, and lots of other GMO sourced preservatives and flavoring. You can read the whole list here on their website. … Chick-fil-A chocolate milkshakes have well over 30 ingredients, including HFCS, Yellow #5 & 6, Red #40, carageenan, mono and diglycerides, soybean oil (GMO), and lots of other stuff I can’t pronounce. Even the plain IceDream cone has food coloring in it. Here is the whole list. … Every condiment or sauce from Chick-fil-A includes HFCS as one of the first three ingredients, along with a slew of other preservatives, GMO ingredients, and artificial colors/flavors. The reason I am bringing up Chick-Fil-A is because they are a really wonderful company. They provide great careers for people, they do lots of charity work, and it’s a family run company. I admire many things about Chick-Fil-A. And honestly, if I have to eat fast food I would rather spend my money there. But, I think some people might actually think they are feeding their kids “better” food at Chick-fil-A verses going to another fast food restaurant. I only want to say that while the company and service might be top notch, the food is not. It’s all about informed choices….. AND the 80/20 rule. If you want to read more, check out the Food Babe’s post about Chick-fil-A, including her toxic-free recipe for a homemade version of the sandwich!